Renuka Kher is the managing director of Tipping Point’s research and development engine, T Lab. In the heart of San Francisco, Renuka and her team find and fund promising organizations that have various approaches to poverty alleviation in the Bay area. On a path to medical school, Renuka’s life took an interesting turn after participating in a design program. Her experience in science, design, and local nonprofits has informed her refreshing take on the social sector. 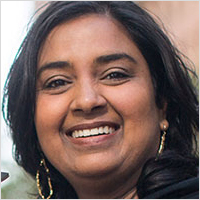 Renuka is a passionate problem solver, and this conversation will ignite you to be one too.